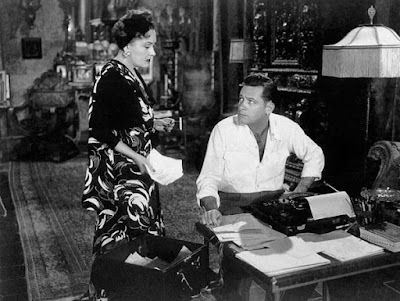 Today, I'm making a list of reasons why William Holden in Sunset Boulevard (1950) is the perfect old Hollywood boyfriend. This article is part of the Reel Infatuation Blogathon hosted by Font & Frock and Silver Screenings. On paper, the character of Joe Gillis in Sunset Boulevard (1950) isn't exactly the perfect boyfriend. He's an out of work screenwriter who is sponging off a certifiably wacky silent movie queen, not to mention that when the movie begins he's floating in a pool with a fatal gunshot wound to the back. However on celluloid, Joe is embodied by William Holden, which, at least for me, means he's about as near to perfection as any man can get. There are dozens of reasons to watch writer and director Billy Wilder's caustic Hollywood noir, but Holden's Academy Award-nominated performance (I think he should have won) is certainly in the top ten. 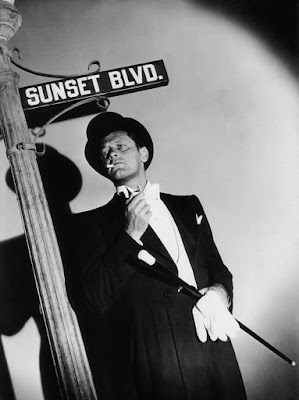 Joe is a tricky character to play -- in other hands he could have come off as either a weakling or an amoral con artist -- but Holden's particular screen magic brings to the character a sardonic humor and sensitive masculinity that is endlessly attractive onscreen. Also, he looks really, really good in tuxedo. So with that in mind, here's five light-hearted reasons why Joe is the perfect old Hollywood boyfriend. 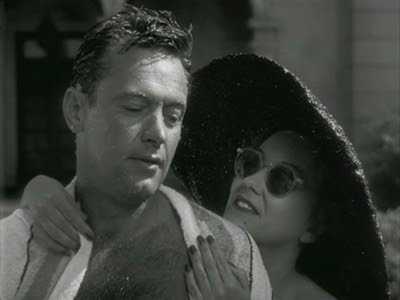 Gloria Swanson and William Holden in Sunset Boulevard (1950). 1. He's a good listener. 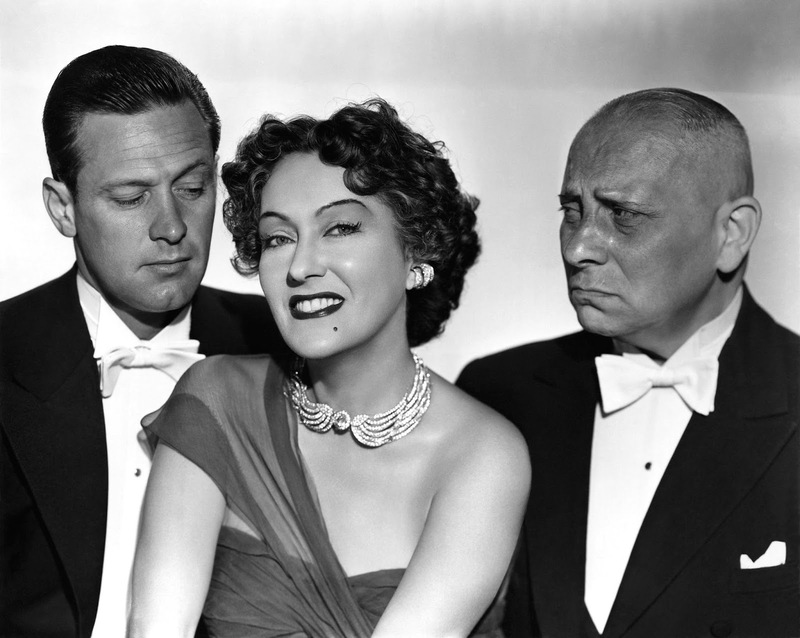 One of the reasons silent movie star Norma Desmond (Gloria Swanson) immediately takes to Joe is that he is sympathetic to her concerns and actually cares, or at least appears to care, about her problems, whether its planning a chimpanzee funeral or writing the perfect script for her big screen comeback. William Holden, Gloria Swanson, and Erich von Stroheim in Sunset Boulevard (1950). 2. He'll make your old boyfriends jealous. 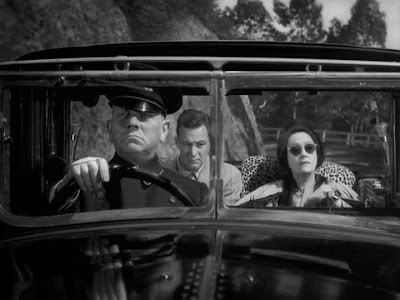 The minute Norma's former husband turned servant Max von Mayerling (Erich von Stroheim) gets a look at her new golden boy, it drives him into a fit of jealousy that leads to moody Phantom of the Opera-esque organ solos. Erich von Stroheim, William Holden and Gloria Swanson in Sunset Boulevard (1950). 3. He'll go shopping with you. Joe's your man anytime you feel like strapping on the leopard print turban and dusting off the Isotta Fraschini for some retail therapy. 4. He looks good in a swimsuit. I don't really need to say any more about this particular subject. As they say, a picture is worth a thousand words. 5. Last but not least, he'll watch your favorite old movies with you over and over and over again. What more could you ask for from a man than that. Sunset Boulevard is available for streaming on Netflix and for DirecTV subscribers. It is also available on DVD, Blu ray, and video on demand. BRILLIANT! I love, love, love this essay. When I first started reading, I was skeptical about the "perfect boyfriend" premise, but your arguments have sold me! Especially the one about shopping – I almost choked on my lunch with laughter when I read about the leopard print turban! 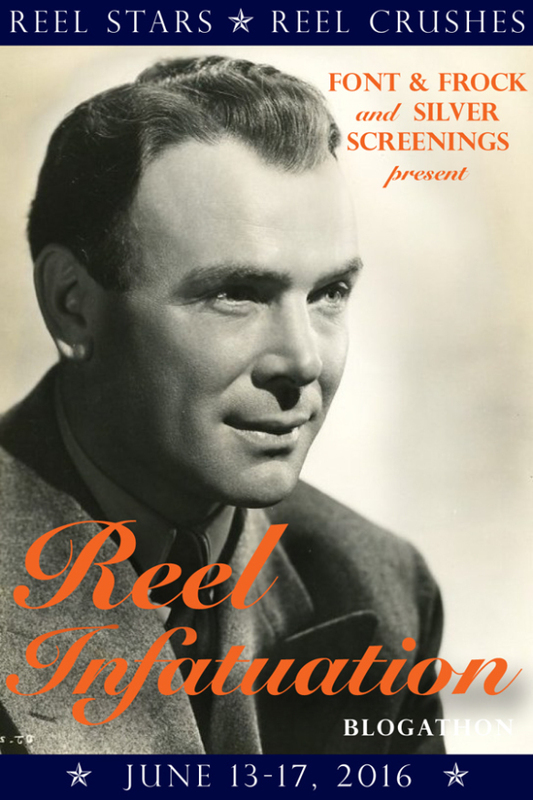 Thanks so much for joining the blogathon and for bringing Joe Gillis to the party! I'm glad you liked it. This was a good idea for a blogathon and I had a lot of fun writing the article. William Holden was not the first choice for the part of Joe Gillis Montgomery Clift was scheduled to play the role but he backed out at the last minute giving William Holden his break out role for in 1952 he would win his oscar. Thanks for the info. Montgomery Clift would have brought a completely different interpretation to the character. THIS IS JUST PERFECT! I LOVE BILL HOLDEN SO MUCH- and Joe Gillis- poor Joe he didn't get the job, the girl, or the pool- BUT at least he has many fans!!! Awesome job!!! Thanks! as Lucy Ricardo said "BILL HOLDEN!" Yes, I want a man to watcxh old movies with me! Joe is, indeed, a perfect boyfriend and I had never realized that! Fantastic, very funny post. I loved it.